My favourite sister-in-law popped over today with my youngest niece as we are on our holi-bubbles and doing a spot of decorating she brought over a lovely soup which we had for our lunch. 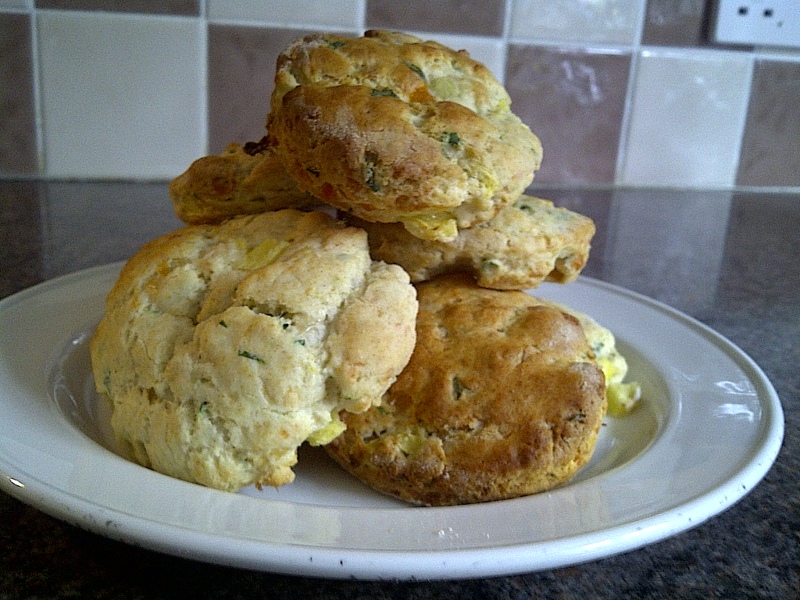 Whilst we were eating she was sharing a story about how she loves pineapple & cheese but wondered if they would make edible savoury scones and her husband thought she was mad! Well to me as a chef that’s like a red rag to a bull!, could this retro 70’s buffet snack loved buy so many people on birthday parties and “nibbles” when people come over be reinvented as a savoury snack? As luck would have it I had a fresh pineapple sitting on the side so we set about having a go. We rubbed the butter in the flour and baking powder then added the rest rolled them so they were 1cm thick cut them out with a cutter and popped them in the oven for 10 mins at 200 degrees and went off for a cuppa. The Verdict AMASING!!!!! Eaten warm they are now going to be a regular treat! It’s got me thinking what else can we reinvent?………………………………..
Today sees the first day of a 2 week holiday from work, so it has been a day for pottering, and getting all those jobs that you have wanted to do but just haven’t had the time. On Friday I had my potatoes delivered from JBA and I was on the whole pretty pleased with them as my regular readers will know I am growing 9 different varieties of potato this year some are heritage variety’s that aren’t common place. I washed them all this year this is something that I don’t normally bother with but I have read a lot of blogs lately and lots of people do this so I thought I would give it a go this year. 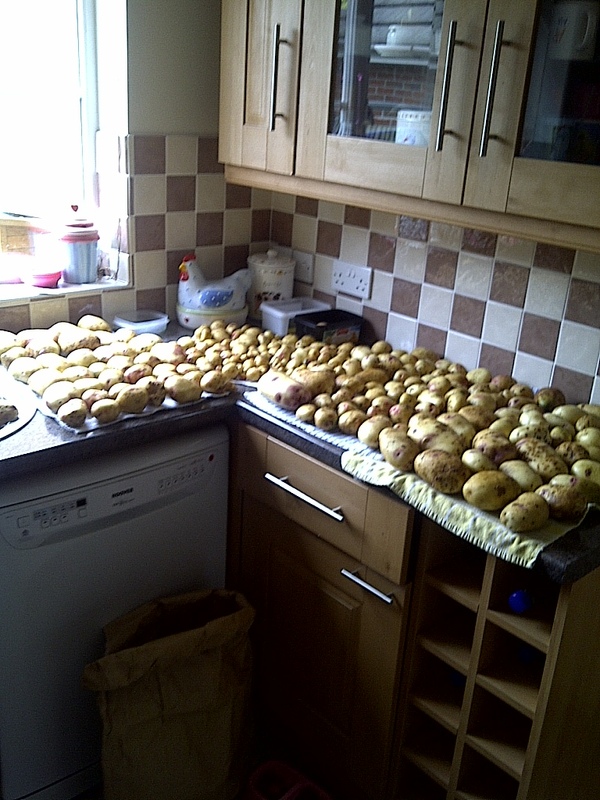 The potatoes are now resting peacefully in my greenhouse in my garden. 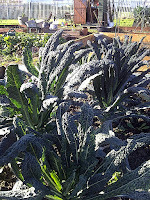 Another job that needed doing was digging up the Brussels sprouts that didn’t produce any sprouts but did get infested with whitefly this was the only crop this year that put on a poor show. I have had to throw the towel in and concede defeat with sourcing free bark chipping for the plot, I tried everything, the local council, local tree surgeons whom on the phone were happy to oblige but when asking when you could collect it or have it delivered new came true to their work I even drove around trying to hunt it down by local roads and woodland areas where work was being carried out but all I got was a big fat nothing! So I have started buying bark. This really goes against all that I am aiming for on my plot but I did do extremely well with sourcing timber for the raised beads and the shed both of which practically cost me nothing, you can’t win them all. So I have been busy laying this down on the plot too it’s starting to look good and hopefully keep all the pesky weeds down this year, when it’s all covered I will post a pic. 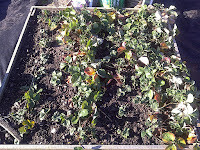 · Make a new compost bin as 1 isn’t enough this will also help me keep it turned. · Start digging the beds over. Let’s hope the weather is kind to me. When I was a boy I was always given broad beans to eat I HATED them my farther loves them which is why we had them so often, and a consequence of this I haven’t eaten them since. When I was younger I also disliked tomatoes and beetroot but are now 2 of my most adored vegetables, so this year I am going to give them a second chance and see if I have changed my mind. As a chef I cook with them all the time and to a chef the broad bean represents the start of the British growing season proper. They lend them self well to most things but a dish I always go back to is a spring veg risotto simple light and shows off all the early produce, and against the white of the risotto rice really shows of the bean and makes it the star of the show. So last Thursday I got cracking and me and my 3 year old daughter sowed our board beans, she love’s helping Daddy in the garden and she is in charge of putting the seeds in the seed trays then I poke them down. I am growing a variety called masterpiece Green long pod has anyone else grown this variety before? What’s it like? 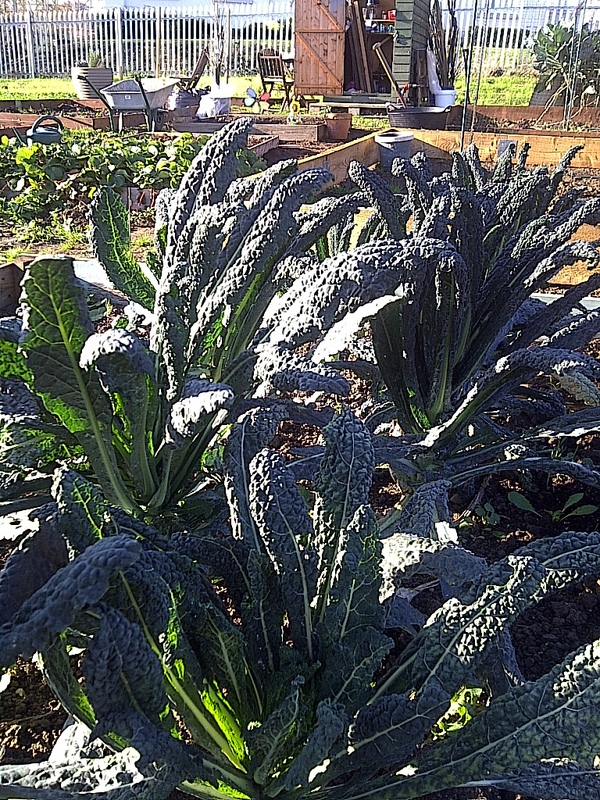 If anyone has any good advice on growing these then I am all ears, what they like dislike and when to pick them. I suppose that’s why an allotment is so good as you can afford to try new things and experiment a little with vegetables that otherwise you would give a miss, and getting my children involved in growing and seeing vegetables grow they are more inclined to eat them as they have helped them in some way, that’s what I believe anyway. 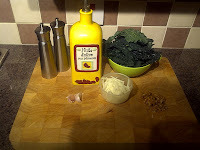 This year I have had a go a growing onions from seed, I have never done this before I have always gone down the route of sets and put them in end of march beginning of April, but now I have the allotment I thought I would give seed onions ago as in the long run will be cheaper. I have read a lot off for and against sowing from seed but the only true way I will ever find out I believe Is to do it for myself and see. 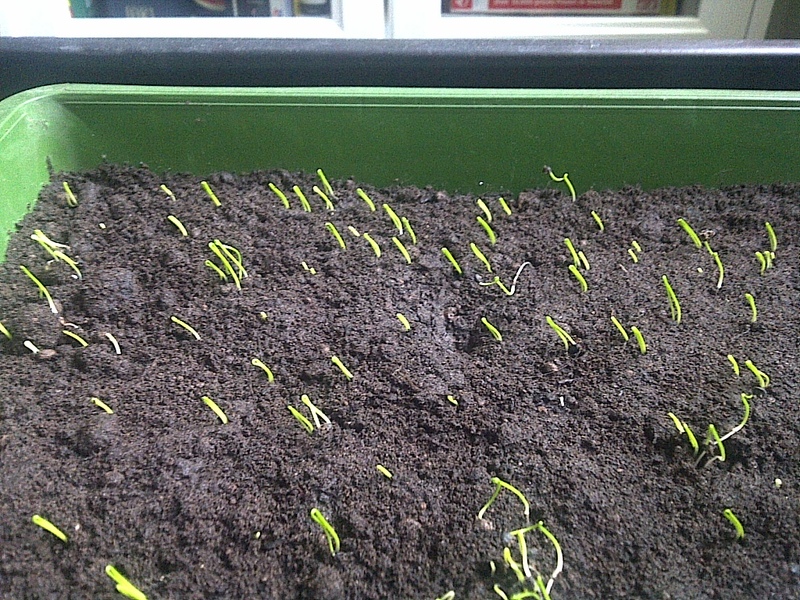 I will also grow some sets but only one variety as yet to be decided and I may choose a Red onion as I love onion in salads but the onion form seed I have chosen is F1 Santero mainly because last year I had Downy Mildew and this variety is resistant to it I sowed the seed last Monday and it has now over the last 24 hours started to show. So I suppose the season has begun for me this is the earliest that I have ever sown seeds as I normally wait till march before I start but now I have the Allotment this will all change I suppose . Along with my potato experiment this year I will also run a seed Vs Set test and this will hopefully aid me in the future to decide seed or set. 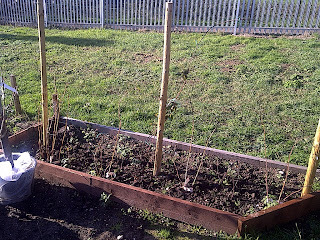 I have always had a bit of a love hate relationship with growing fruit I love it, it HATES me! In fact the first thing I ever grew myself was fruit, Raspberries to be exact in a large 40lt pot up a wigwam of bamboo canes. I had it for about 4 years in total but didn’t really get much from it fruit wise as I didn’t have a clue about growing then and didn’t have the first clue how to look after it. All in all I have had Raspberries, Gooseberries, and strawberries. It wasn’t until I started to get more involved in growing that I learned that fruit are a bit like female pop star Divas they constantly need your attention and TLC! 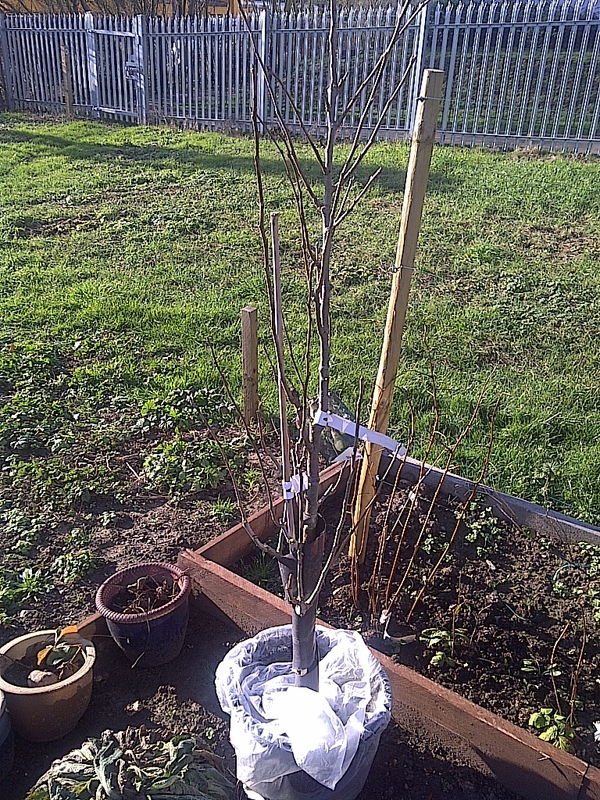 I moved house about 6 years ago now and inherited a wonderful Cherry tree it was only 2 years old but to this day don’t know the variety but it was in the middle of the garden (don’t have a clue why!) so we dug it up and moved it again not really knowing what I was doing! It was touch and go for about 3 months and the following year we got nothing from it but WOW what a great harvest we get from it now. I have learnt what it needs and when it needs it. So when I got the allotment last year I knew straight away that I wanted fruit and lots of it but also knew that I would wait for my second year before doing so which brings us to the now. Strawberries were the exception, I have always grown strawberries with little success the odd fruit here and there but nothing I would call a harvest so I dug what I had at my home garden which was about 8 plants and re-located them at the plot I gave them a good starting bed and over last summer they again didn’t provide much but I was more interested in them reproducing so to speak I wanted my 8 to become 108 so left them to put out as many runners as they wished! 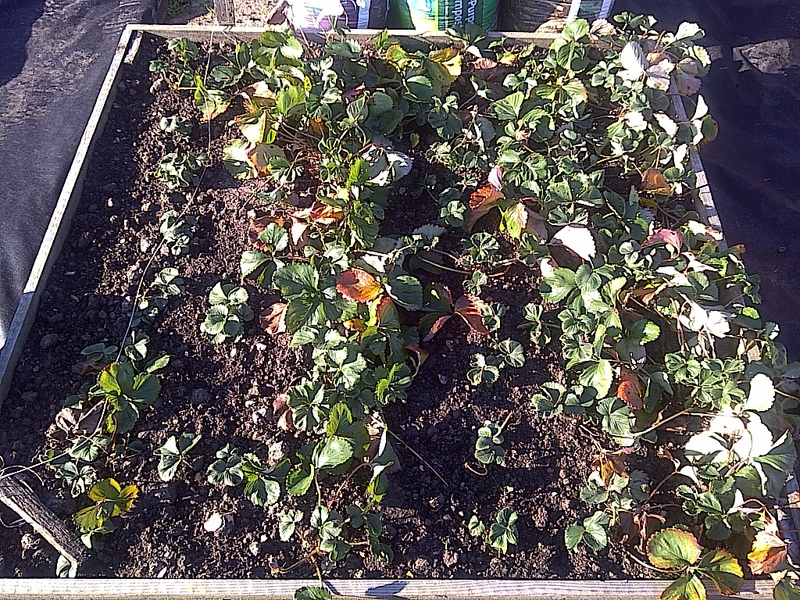 So in mid-December I dug them all up and re-planted them in their permanent home I ended up with 68 plants in total now and hope over the next few summers I may finally get a crop fingers crossed. 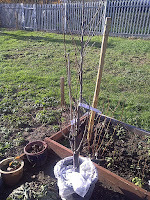 All that’s left to do now is find the right spot for my pear tree and Gooseberry bush give them the best start that I can and hopefully 2012 will be my best EVER year for fruit. Today I managed to get down to the plot again as I need to get the paths sorted before the new season is upon us, I was taking a well-earned Tea break when my mind started wandering and I was thinking to myself “that Cavolo Nero needs using up before it becomes Percy food (Percy is My daughters Duch Rabbit) or even Hefty’s and Hilda’s mid-week special snack. When I came up with a great idea for it, so when I was finished up the plot for the day I grabbed myself a good bunch and headed home. First I toasted my walnuts, and then put aside to cool. 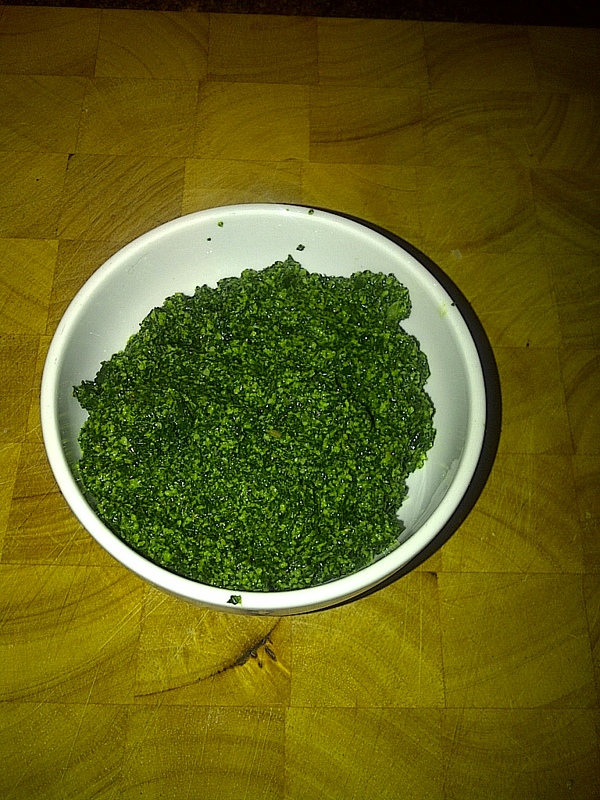 Then I blanched my Nero in boiling salted water for 40seconds no more then removed from heat and refreshed under cold water and squeezed all the water out. Then in a food processor I added the Nero and the walnuts and blitz until it was a course chop then added the garlic and parmesan then blitz until a smooth paste. 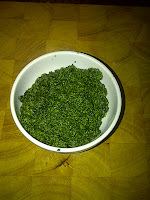 Add the olive oil to create a smooth paste (about 2-3 tablespoons). 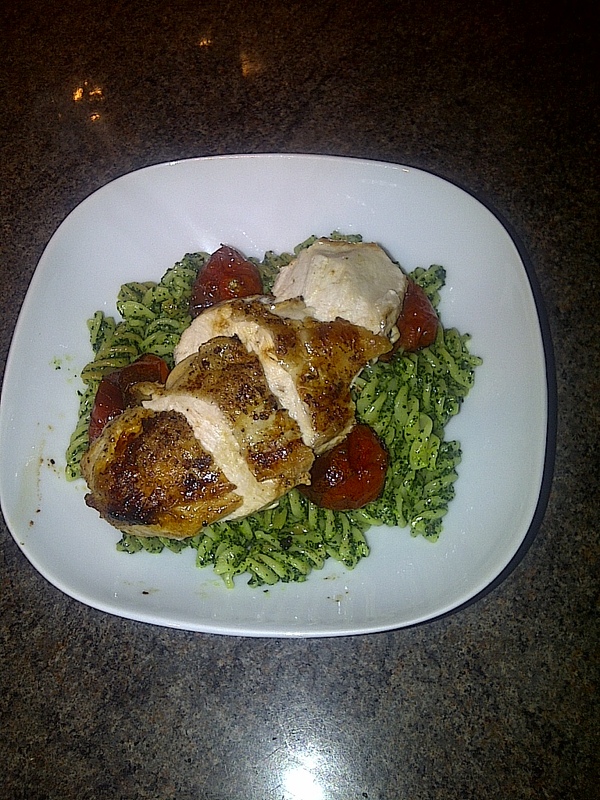 I can confirm it was VERY tasty and what a different way to use your Cavalo Nero. 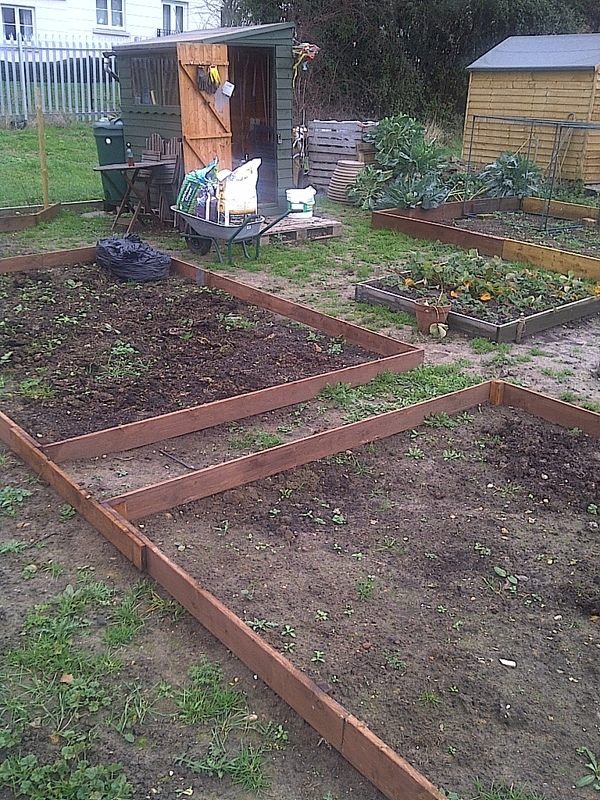 Have spent a lot of time lately reading a lot of gardening blogs and they all have one thing in common…………..LETS GET CRACKING, so today I went to the plot to start a BIG job. 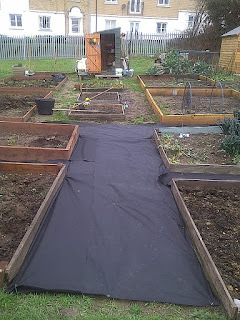 The aim is to put down landscape fabric so that I can bark over the top to keep the weeds down as last year as it was a fresh plot the weeds were a Nightmare at one point some were knee high and I was going down to the plot 2-3 times a week but just could not control it. 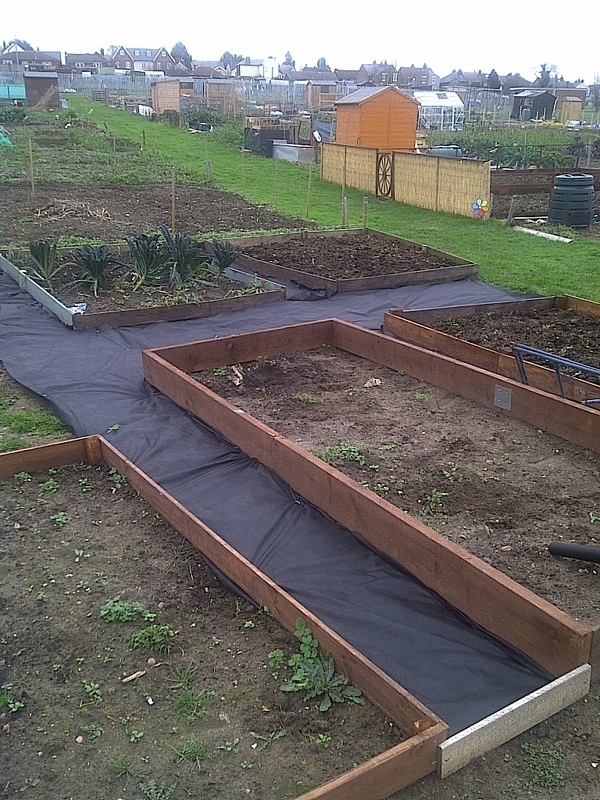 The plot itself is over a half plot but not quite a full size one its 17meters long by 12meters wide and I have allowed enough room on the walkways to get a wheelbarrow down so about 80cm wide, back in November I put the finishing touches to my raised beds. I spent in total £35.00 on fabric all 20m long I had to shop about for the barging though! The Range was the best as it was not only 20m long but it was 2m wide. I haven’t got the bark chippings yet but think that’s going to cost me another £40.00 which will be the most I have spent on the allotment to date as my ethos is to, where I can recycle or reuse. 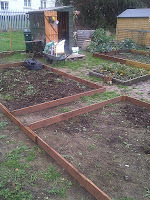 It took me 3 hours to do a 3rd of the plot so planning on going tomorrow to finish it off as I can spent more time there. Then once that’s done all the structural work is almost complete and I can concentrate on the most important part of the plot…………………………………….the soil. 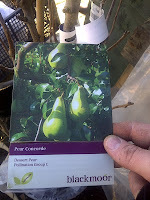 The other day the wife and I were looking for bargains at our local garden centre, but what made me start thinking was in the entrance were LOADS of potato seeds, is that time already I asked myself, last year was a bit of a rush for me as we didn’t get the plot till late in the year, May in fact so we didn’t really think about potatoes until late spring. 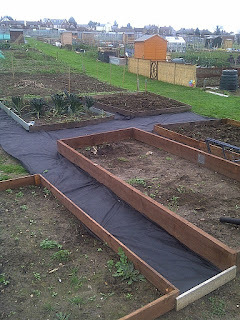 So this year I want to be ready as they make up a good bulk of your allotment also are great for braking up the soil. We didn’t really chit them and just put them in and hoped. To my surprise we had a really good crop of potatoes the Sante I was practically surprised with as they were very prolific and tasted great. this was last years Sante Crop from 2 rows 2m long about 30KG! I got 10 tubers of each the plan is to grow 1 row of each and see what does well and what needs changing for 2013. Putting my chef hat on some of these are old varieties need to be brought into the main stream to keep some of our heritage from vanishing all together. And by purchasing some I hope to play my part in it and I will be singing from the rooftops to all my friends and family and fellow Allotmenters about how great they are. So the date set in the Calendar is Wednesday 25th January that’s the delivery date! I have started collecting Egg trays from work in readiness!